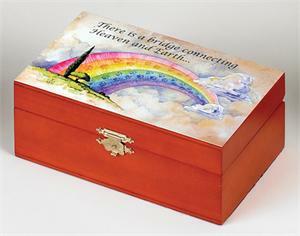 Inspired by the well beloved poem "The Rainbow Bridge", this beautifully decorated box evokes the thought that while our faithful friends have left our side, we remain connected. Artist Nora Wildgren provides the artwork that stirs the imagination of what the Rainbow Bridge may look like should we be able to see it. Available in three sizes, each one is stained by hand and also features a velvet lined bottom with the inside cover and base also lined in velvet. A hinged clasp helps to assure that the cover remains closed. 7 in. x 4 in. x 2-3/4 in.